Tell us your story about some great flea market finds you have displayed in your landscaping. Share your photos too. The invitation is below on this page. Read on. This photo shows a recent favorite treasure I found at our local peddlers mall. I am using it as a display piece from my fall decorations. This old galvanized tub would also look great hanging on the side of a garden shed. With flea market finds sometimes the thrill of the hunt makes the shopping experience more special. You never know what kind of treasure you are going to find when you shop at flea markets, antique malls, peddlers malls or yard sales. This watering can is used as a planter in my landscape. I drilled a hole in the bottom of it for drainage. You can turn many items into planters for your gardens. I use wagons as planters too. Be creative when decorating in the garden, that makes it fun. Have A Great Story About using Flea Market Finds in Your Gardens? Do you have a great story about some flea market finds you use in you landscaping? Share it! We will publish your story on this website. Entering your story is easy to do. Just type!...Please only sibmit a story about this topic. The picture below is an example of using old items in your landscape. 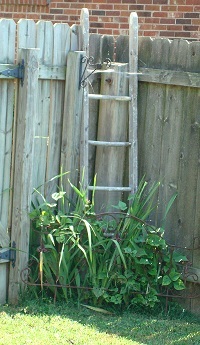 This is part of an old ladder that was salvaged from a barn we reclaimed. See how good it blends with the wooden privacy fence.I placed it in the corner of my backyard and have glads and hyacinth bean vine planted at its base. I use a piece of wrought iron fencing placed in front of it to hold the glads upright. Mixing wood and metal objects works good together. The link below will take to the page on ways to use barnwood in your home and garden. There are some great ideas there! I love old stuff. Obviously lots of people do, it is Big Business! 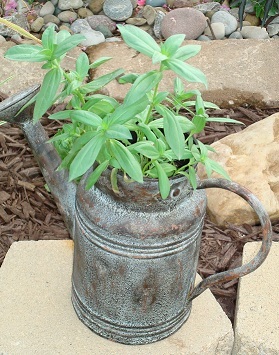 My personal favorite uses for flea market finds include using old items in the garden and landscaping. I highly recommend that you get creative with you adventures and think outside the box. 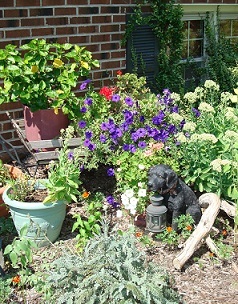 Lots of old items can make wonderful planters, accents, focal points and more in the landscape. Old tools look great hanging on sheds, or on posts. Birdhouses are wonderful on top of posts, pergolas and on fences or turked in between assorted potted plants. I collect colorful roosters, I have so many that I have started moving them outside into the garden. I use them inside in my kitchen too. They look great mixed in my garden in my side yard! My point here is, do something usual. If you like the item put it outside and enjoy it. If it fades a little, consider that added character. This photo below shows metal skeleton keys on a rusty hanger on a post outside in our backyard. The hook came from salvage from a job site. We have 2 of them attached to 2 posts. The hooks are great for hanging outdoor objects on. My husband and I bought the skelecton keys on our honeymoon. We hung them on this old hook. It adds something unexpected to our backyard landscaping. There is another set of skeleton keys, (different variety) on the other post. These items stay outside year round. The rust just adds character and makes them look older. Old stuff in the garden is cooler than new stuff! My favorite time of year is autumn. Autumn is such a colorful time of year with the leaves changing, it is the perfect time for landscape displays. 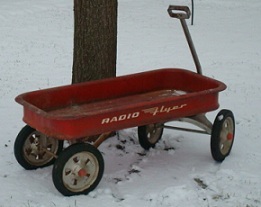 I have an old radio flyer wagon - a favorite flea market find! 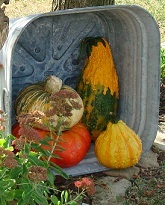 (pictured above in winter) that gets used in the yard with pumpkins, flowers and gourds decorating it. The wagon came from a peddlers mall we stopped at while traveling in Pigeon Forge Tn. (See the picture above of the wagon in a winter shot. I was using it as a squirrel feeder beside a tree in the front yard. When my husband and I shop we don't buy alot of stuff (could be because we have so much decorative stuff already). But we usually get something really cool on our travels. The wagon I mentioned before was bought with cash we received from a family member for Christmas. The old wagon is very special to us for that reason too. When you purchase old things on your flea market shopping spree if is fun to have a story behind the "flea market find". Wagons are perfect for displays for assorted sized potted plants. Wheelbarrows are also ideal for the same purpose. I have a decorative wheelbarrow in my front yard this summer that has an assortment of flower pots with a variety of annuals displayed. It is a very pretty display. Featuring my favorite color - purple. I have a orange front door, the purple petunias along with other flowers looks nice with the door. See the picture above. When in bloom the hibiscus blooms an apricot color. See how I changed this look for fall. Check it out at the link below. I added some of my favorite flea market finds with seasonal items. See how a few changes for the season can make your landscape look different. I also plant lots of mixed colored marigolds and zinnias and sunflowers. There is lots of orange shades in these flowers. I grow all of these flowers from seed from my garden. Some suggestions for your shopping pleasure - great flea market finds don't have to be expensive. Do some looking before you buy. Get educated. You will find that the price for something you are looking for can vary from vendor to vendor. We visited the 127 yard sale for the first time this year. Unbelievable! The amount of flea market finds at this yard sale are unending. We will have to go again next year. We only traveled about 10 miles on Rt 127 and the variety was amazing and so was the price differences. My favorite flea market find on that trip was definitely different. We picked up a wonderful set of old table legs that are destined to hold barnwood birdhouses on a upcoming project we are going to do. We both fell in love with the table legs and bought them for a buck a piece! We bought a few other things on our adventure too of course. The 127 yard sale is the first weekend of each August, actually 4 days- Thurs-Sun. If you are into flea markets, yard sales etc. GO....highly recommended. The 127 yard sale is over 600 miles long and is amazing. Next year we are going to go earlier in the day. It does get hot, so be prepared for alot of walking and high temperatures. And expect to have a blast looking for your favorite flea market treasures. I highly recommend Peddlers Antique and Flea Markets - usually a huge selection of vendor booths with lots of variety. If you are ever in Lexington KY, visit the Lexington Peddlers Mall. We have a booth there- upstairs Booth # 400 Rented Mule. Our booth has lots of old stuff, barnwood signs and barnwood crafts, flower seeds from Freda's Favorite Flowers (our private garden) and alot more. 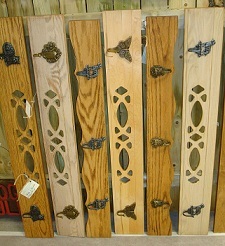 This photo shows coat racks we have in our booth. The coat racks have themed hooks such as cats, dogs, and gardening. That is something you won't find in a department store! The Lexington Peddlers Mall has over 600 booths. Lots of fun awaits. I have a huge collection of Scrappy Signs in our booth. See the picture below for an example. Old barnwood signs from Rented Mule, are perfect for hanging in your garden. All signs are one of a kind. Custom signs with any saying are available. The sign below says Antiques and old stuff. I also make gardening signs out of antique Kentucky barnwood. Visit the link below for more details. Click on the picture of the Antiques and Old Stuff sign to find out more about our booth at the Lexington Peddlers Mall. You can order Handpainted Barnwood Signs here, with any custom saying you want. The Scrappy Signs are weatherproofed on the painted side for outdoor use. I make these barnwood signs. 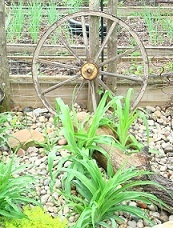 This photo shows an antique wagon wheel, we use 2 of these in our backyard landscaping. I just love these things! This one is shown leaned up against one of our posts. We take the wagon wheels inside during winter weather because we don't want them to fall apart. When using flea market finds in your landscaping, be selective where you locate items. Don't display so much in your front yard landscaping that it looks tacky. Sprinkle a few items in with your front yard landscaping to add to your curb appeal. Plan on putting more of your special flea market finds on display in your more private garden areas, such as your backyard secret garden or deck. Decorative planters are perfect for porches, steps and wheelbarrows or wagons in your front yard landscaping.